Partnership discussions are underway for our next big release! As reported by the NY Times, discussions have been underway for further advancing our technology platform. Discussions have reached and advanced stage, and we look forward to being able to announce some fantastic advances in the coming weeks. As the second half of 2015 is well upon us, we felt it time to bring things to the next level and start integrating with the latest and greatest technology offerings - from payments systems, to Android and iOS apps. Stay tuned, exciting news to come! MyTV Video Server Scheduler and Chameleon Encoder support the Roku set top box! For all those MicroVideo customers that have been patiently waiting. the new MyTV Video Server Scheduler has been released! (Optional) built-in functionality may include: scheduling stored video as well as "live video" from capture cards like BlackMagic Design's Intensity Pro, outputting to formats such as SDI and ASI, transcoding utilizing our Chameleon Encoder to output streams in multiple formats and data rates, and streaming protocols like MPEG TS for IPTV and RTSP for Wowza servers to stream to "all" devices! Check out the new MyTV Video Server Scheduler by watching the help clips! The MyTV Video Server Scheduling System is video scheduling software that allows the creation of â€œProgrammable TV Stationsâ€�, with remote video scheduling for uses such as scheduled broadcasting for satellite and cable TV or IPTV, low power TV stations and digital signage type scenarios. The MyTV Video Server Scheduling System has evolved from MicroVideo's MvTv or "Legacy" Video Server Scheduling System. The 2 systems are not compatible, as the MyTV Video Server Scheduling System is designed to be deployed cross platform, and is presently released for the Windows platform, shortly to be followed by the Linux (Ubuntu) release. 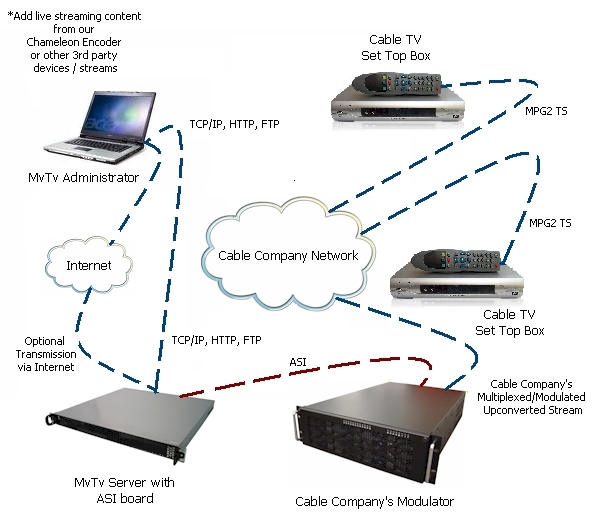 MicroVideo's MyTV Video Server Scheduling System has many enhancements over the "Legacy" MvTv Video Scheduling System, notably a single installer, which installs all of the required various software components, the Video Server, the Video Scheduling Administrator, and the Video Channel (Client) / Streamer. Video Scheduling can be performed locally on the Video Server, or remotely using the Video Scheduling Administrator. Unlike the "Legacy" MvTv Video Scheduling software, the new MyTV Video Scheduling System has both the "Repeater" and "Scheduler" functionality built into the same software. The "Legacy" system was either / or. When "Repeater" or "Looper" mode is selected, playlists are not time based, they just keep "looping" or playing over and over until they are changed. The MyTV Video Server "Scheduler" System on the other hand, is based on time. in that it plays content according to a schedule, using playlists that contain videos totalling up to 24 hours in duration. Example: at 10am a MyTV Video Server Scheduler Channel (Client) plays "X" playlist which contains 12.5 minutes of video content, then at 10:12:30 am, it plays the "Y" playlist, which is a collection of commercials which runs for 5 minutes. At 10:17:30 am it plays the "Z" playlist, which runs 12.5 minutes of programming. Unlike the "Legacy" MvTv Video Server Scheduling System, the MyTV System does NOT require a playlist to be a minimum of a half hour long and maximum of 4 hours long. In the "new" MyTV Video Server Scheduling System, playlists are recommended to be between 1 minute and 24 hours in length. Also new to the MyTV Video Server Scheduling System is the ability to schedule or loop "live" streams or sources. If the "live" option is available, at 10:30 am, "live" video could be scheduled from a video stream from the Internet, or with an optional capture card, video could be supplied from a video camera, mixer or even a Set Top Box (STB). The (optional) ability to stream directly from the MyTV Video Server Scheduler System without the need for third party encoding software like the Windows and Flash Media Encoders not only makes the scheduling system much easier to use, but also removes the requirement to transcode videos if they are already formatted for streaming over the Internet. However, if transcoding is required, the new MyTV Video Server Scheduler System provides that (optional) functionality built-in. You can now have a master library of videos in HD format, and schedule them to play, but actually stream them simultaneously to various devices at different bit rates and video resolutions using the optional "Chameleon Encoder" transcoding option. Whatever the needs, either the new MyTV or Legacy MvTv Video Server Scheduling Systems allow those who have visual content (such as universities and colleges, high schools, hospitals, doctorâ€™s offices, retail outlets, etc.) to play their video content locally, or to cable TV or satellite broadcasts, or stream it over the Internet to one or multiple devices in possibly multiple formats. The MyTV Video Server Scheduling System software components are installed onto standard off the shelf hardware with generic Microsoft Operating Systems like Windows XP, Vista, 7 and Server 2003 and 2008, but can be purchased bundled on rack mount servers as well. The MyTV Video Server Scheduling Systems are constantly being upgraded. Check back often for the latest offerings! For customers who don't have the required hardware, you can find it at local electronic stores and online. The MyTV Video Scheduling Server is a service that operates on the Microsoft Windows family of Operating Systems, as well on Linux Ubuntu. The number of simultaneous streams that can be serviced by the MyTV Video Scheduling Server is dependent on the hardware it's running on, and what load is required of it (standard definition or high definition videos, etc). It most cases it's more effective to use the MyTV Video Scheduling Server to transcode scheduled playlists into multiple formats, and stream each format to a streaming provider (CDN) and have that provider stream multiple copies of each format to the end users. 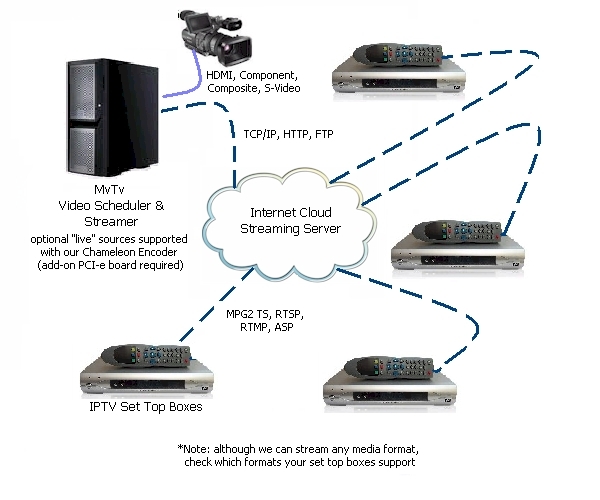 The MyTV Video Scheduling Server and Streamer can deliver multiple streams directly to playback devices such as set top boxes, smart phones and PC's, or stream to CDN's (Content Delivery Networks) for redistribution to an unlimited number of devices. The Server stores video scheduling data such as clip name, start and end points, duration, storage location or URL, and also stores Channel and Playlist information in its database. Unlike the MvTv Video Server, the MyTV Video Server utilizes a "Firebird" database rather than a MS SQL or Access database. Hosted Solutions are also being developed, removing the requirement to obtain your own hardware. • MyTv Server Software (and valid license). The MyTV Video Server Scheduling Administrator is used to create MyTV Video Server TV Networks and Channels, create scrolling text messages, upload video content to the MyTV Video Scheduling Server, as well as create and schedule playlists for the MyTV Video Server Channels. The MyTV Video Server Administrator can also (optionally) provide complete reporting of all clips played by the MyTV Video Server Channels. The MyTV Video Server Scheduling Administrator can be operated locally on the same hardware as the Server, or remotely via TCP/IP. • Microsoft Windows 2000, XP, Vista or 7, or the Windows Server family of Operating Systems, such as 2000, 2003 and 2008. • MyTV Video Server Administrator Software requires the MyTV Video Scheduling Server to have valid component licenses. The MyTV Video Channel (Client)/ Streamer plays or streams full-motion, up to 1080p HD video using Codecs such as H.264 and streaming protocols such as MPG2 TS, UDP, RTSP, HTTP, and shortly RTMP. With our optional, soon to be released transcoder option, you can simultaneously transcode and stream your videos using Codec standards such as H.264, MP4, and WMV. With the transcoder option, you can simultaneously transcode and stream for devices such as smart phones (iPhones, and Blackberry's), tablets (iPads and Windows tablets), PC's (laptops, desktops and servers) as well as IPTV set top boxes, all at the same time. Adding our ASI or SDI options allows you to stream your TV Channel for satellite and cable TV transmissions. Adding a video capture card such as the BlackMagic Intensity Pro with our "Live Source" option allows streaming from live sources such as video cameras, DVD and BluRay players, Set Top Boxes (STB's) etc., or playback via the video outputs to monitors or cable plants via modulators. The MvTv Legacy Broadcast Video Server is a service that operates on the Microsoft Windows family of Operating Systems. Low volume systems (under 10 Channels) can easily operate from Windows XP, Vista and 7 while heavy load systems should use Windows Server products like 2000, 2003 and 2008. The server stores video content for distribution to the MvTv Legacy Broadcast Video Channels in its Library, and also stores Channel and Playlist information in its database. Databases are MS Access, but can be upgraded to MS SQL. The MvTv Legacy Broadcast Video Server uploads playlists, scrolling text messages and videos to the MvTv Legacy Broadcast Video Channels as they're required. • Microsoft .Net Framework 3.5. • MvTv Server Software (and valid license). • Optional: Microsoft Access 2000 (or higher) or MS SQL depending on database configuration. The MvTv Legacy Broadcast Video Administrator is used to create MvTv Legacy Broadcast Video TV Networks and Channels, create scrolling text messages, upload video content to the MvTv Legacy Broadcast Video Server, as well as create and schedule playlists for the MvTv Legacy Broadcast Video Channels. The MvTv Legacy Broadcast Video Administrator can also (optionally) provide complete reporting of all clips played by the MvTv Legacy Broadcast Video Channels. • MvTv Legacy Broadcast Video Administrator Software requires the MvTv Legacy Broadcast Video Server to have valid component licenses. The MvTv Legacy Broadcast Video Channel plays full-motion, full-screen video with or without scrolling text, to TV screens, computer monitors, as well as digital and flat panel monitors, by connecting the video outputs on the PC to the video inputs on the display device (or to a modulator if the Channel is to provide content for a cable plant). The video output can also be screen captured, or connected to video capture cards, and streamed to the Internet. The MvTv Legacy Broadcast Video Channels continuously poll (every minute is the default configurable setting) the MvTv Legacy Broadcast Video Server for new playlists and automatically download new content from the MvTv Legacy Broadcast Video Server when required. Each MvTv Legacy Broadcast Video Channel can have a unique ID, so that the administrator using the MvTv Legacy Broadcast Video Administrator can create unique content for all MvTv Legacy Broadcast Video Channels in that TV Network. The MvTv Legacy Broadcast Video Channel software is smart, in that Internet or network connection disruptions do NOT affect its video playback quality, as all content is stored and played from the Channel's hard drive. Resumption of broken Internet or network connections result in resumptions of downloading content playlists and scrolling text messages without requiring the downloads to restart from the beginning. (Broken Internet or network connections however WILL affect "live" streaming content). The MvTv Legacy Broadcast Video Channel supports any Codec that runs on the Windows platform, such as ASF, AVI, MPEG-1 and 2, Microsoftâ€™s Windows Media WMV formats, FLV, DIVX, VOB, and even MOV, as long as the corresponding DirectShow filters are installed on the MvTv Legacy Broadcast Video Channel PC. New Codecs like VC-1, and H.264 allow the playback of High Definition content on MvTv Legacy Broadcast Video Channels. (Note that the MvTv Legacy Broadcast Video products do NOT include any 3rd party Codecs or DirectShow filters, but those provided with the Windows Operating Systems are supported). You should also ensure that you only display content on the MvTv Legacy Broadcast Video System that you have display rights for. Use the MvTv Video Tester Tool on your MvTv Channel PC to make sure your clips have the appropriate Codecs installed. Need Codecs? Check out Nanocosmos! Still images can easily be made into WMV videos (and used on the MvTv Legacy Broadcast Video System) by using Windows Movie Maker that comes free with Windows XP, Vista and 7. With these programs you can add narration or music to your movies created from still images or digital photographs. Speechpad video captioning services can be added to enhance production value.With Windows Movie Maker, you can also zoom in and out, as well as add titles and other special effects to your videos. • MvTv Legacy Broadcast Video Channel Software requires the MvTv Legacy Broadcast Video Server to have valid component licenses. 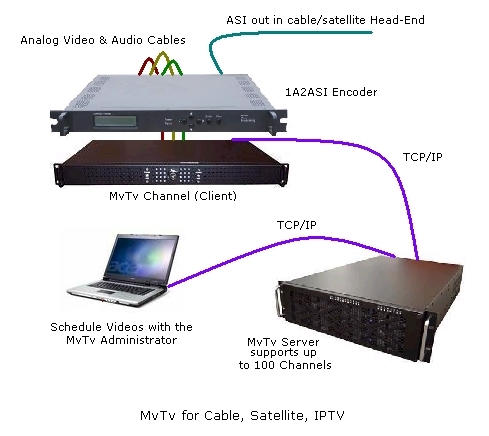 The MvTv Legacy Broadcast Video Internet broadcasting system combines the MvTv Legacy Broadcast Video Server, Channel, and video encoding software. all on the same PC, in order to broadcast high quality videos to a video server located on the Internet. 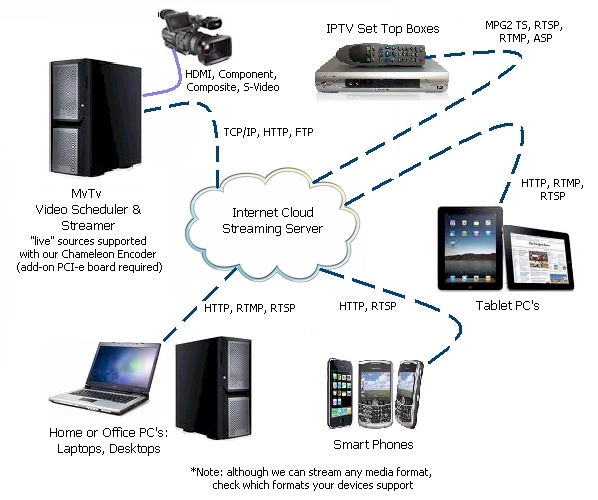 The video server will then serve the streams to Internet clients using any browser that supports Silverlight or Windows Media embedded players. By connecting the MvTv Legacy Broadcast Video Channel's video and audio outputs to a video capture card, other video formats can be streamed to the Internet, such as H.264, Flash or MPEG4/2. We have partnered with major CDN's, and now offer hosting and streaming solutions that rival the likes of Amazon. Contact us to find out more! The MvTv Legacy Broadcast Video Enterprise broadcasting system utilizes a high end MvTv Legacy Broadcast Video Server with MSSQL, to distribute and log clips played by Channels connected via the Internet. Any type of Codec can be used for playback, which is converted to MPEG2 by the 1A2ASI Encoder. The MvTv is a cost effective solution which is perfectly suited for delivering infomercials. Another example of the MvTv Legacy Broadcast Video System in operation is delivering health content to hospital patient and waiting room TV sets. Suppose the hospitals wish to use the MvTv Legacy Broadcast Video System are up to a hundred miles apart. The MvTv Legacy Broadcast Video Server is to be located at one of the Health Organizations' offices, connected to the Internet. 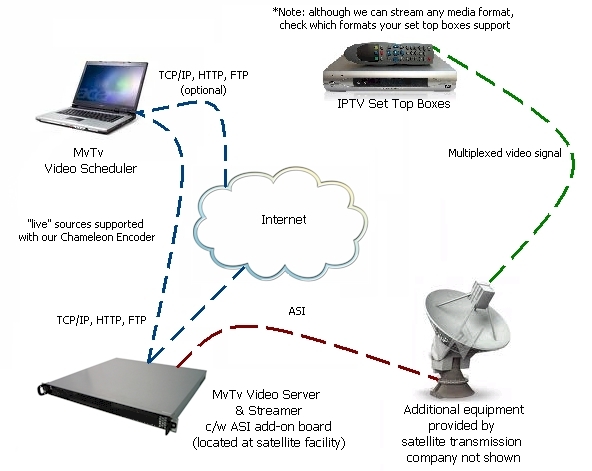 By using the Internet for communications, the MvTv Legacy Broadcast Video System can be deployed using any ISP for the various MvTv Legacy Broadcast Video Channels, including dialup providers where broadband is not available (as long as the "live" streaming feature is not required). Since MvTv Legacy Broadcast Video Channels play content that is stored on their hard drives, the speed of their Internet connections are irrelevant regarding their playback performance. The MvTv Legacy Broadcast Video Administrator can be located and operated anywhere there is an Internet or network connectionâ€¦ in the Health Organizations' offices, or even on the video editorsâ€™ home edit suite. The MvTv Legacy Broadcast Video Administrator is used to upload video content or text messages to the MvTv Legacy Broadcast Video Server, as well as to create playlists and schedule the playlists. In effect, the Health Organizations' video editor can create health content at home, or at the Health Organization's editing suites (located in different physical buildings), and upload the content to the MvTv Legacy Broadcast Video Server from any location. The editor can also program (from anywhere) what content plays in which hospital, at what time, and at anytime in the futureâ€¦ the schedule is NOT limited to 7x24, itâ€™s an open-ended calendar schedule. The MvTv Legacy Broadcast Video System has been designed with ease of use for the operator in mind. In potential installations where hundreds of MvTv Legacy Broadcast Video Channels could be deployed, programming each Channel would be a horrendous task. With this in mind, the MvTv Legacy Broadcast Video System was designed such that MvTv Legacy Broadcast Video Channels would be members of an MvTv Legacy Broadcast Video Network, where all members of a specific MvTv Legacy Broadcast Video Network would play the same content at the same time. 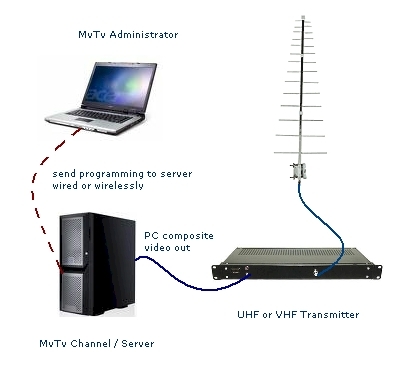 Unlimited numbers of TV Networks and Channels can be created with the MvTv Legacy Broadcast Video System. In turn, custom programming can be created for each individual MvTv Legacy Broadcast Video Network. Rather than push content to each MvTv Legacy Broadcast Video Channel individually, the Channels are smart, and pull the content theyâ€™re required to play from the MvTv Legacy Broadcast Video Server. Every minute, the MvTv Legacy Broadcast Video Channels call the MvTv Legacy Broadcast Video Server and report on what theyâ€™re currently playing, and at the same time, download a new playlist (which tells the MvTv Legacy Broadcast Video Channel what to play and when). If the MvTv Legacy Broadcast Video Channel does not have those video clips already residing on its own hard drive, it will automatically begin to download the files from the server. The MvTv Legacy Broadcast Video Channel is built with real world ISPâ€™s in mind. Should the Internet connection between the MvTv Legacy Broadcast Video Channel and Server fail, the downloads will automatically resume when the Internet connection resumes. The downloading of new content happens in the background, while the MvTv Legacy Broadcast Video Channel is playing its current content (playlist). Should clips no longer be required in the playlist schedules, they can be automatically deleted from the Channels via commands received over the Internetâ€¦ so as not to waste valuable hard drive space on the Channel. The MvTv Legacy Broadcast Video Scheduler Channels check the server for updated playlists every minute, to see what it needs to play during the upcoming hour. If any new video content has not yet arrived in the Channel, the MvTv Legacy Broadcast Video Channel will play the previous hours content. Downloading of video content from the server in most cases is faster than real time play, so that 60 minutes of content might take 45 minutes to download with broadband connections. It is wise therefore to schedule "new" content to play in MvTv Legacy Broadcast Video Channels no sooner than an hour after it has been added to the MvTv Legacy Broadcast Video Server. Because of MvTv Legacy Broadcast Video Administratorâ€™s (optional) reporting capabilities, it is possible to add â€œsponsor clipsâ€� to playlists, and report to third party programming sponsors, how many times their clips played across the entire MvTv Legacy Broadcast Video Systemâ€¦ during any given day, month, etc., and at which location. This feature rounds out the â€œPrivate TV Stationâ€� conceptâ€¦ advertisers know their viewing audience, and can be provided reports on their actual played ads (impressions). MvTv Legacy Broadcast Video Scheduler System Components can be downloaded for free from mvtv_download_page.htm. Demo licenses may be obtained by requesting them by emailing support@MyTV Video.com, or by calling 403-286-0913 after configuring your MvTv System and submitting your data to us. You can buy standard broadcast and streaming packages online using PayPal at Buy Online. Call us for Enterprise (multiple channel) or volume pricing or to purchase over the phone if you have trouble with Paypal.